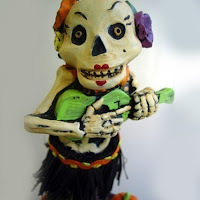 The NY Ukulele Salon proudly presents an evening of jazz ukulele and spooky fun on Halloween night (a Saturday, no less) at The Living Room, in Manhattan's Lower East Side. A great way to start a super fun night downtown! No cover. Tip bucket & 1 drink per set. This trio sings in close family harmony with songs from several eras. Check out DoctorUke.com for songs and other things ukulele. Fronted by Bliss Blood, The Moonlighters play a hip confection of jazz and pop, combining 21st century attitude with 1920's songwriting and virtuosity through vocal harmonies and rocking swing rhythms on ukulele, bass, and steel guitar. Details at BlissBlood.com or Myspace.com/moonlightersny. Rick is the organizer of the NY Ukulele Salon, a sporadic ukulele party and performance series. He will be performing a few songs duing the interludes between acts, in a humble jazzy style. See Bruner.net. Please feel free to invite lots of friends, blog, tweet, etc. It's a big room and our first show there, so we should fill the place to assure we're invited back. Plus, it's going to be an amazing show, after which you'll be in party central for Halloween in NYC. RSVP on Facebook or on Eventful or on Going.